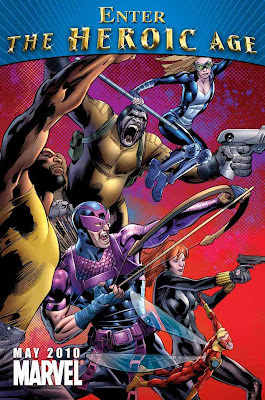 Now, I don't want to be hating on Marvel, and I usually like Bryan Hitch's and Karl Kesel's work, but I'm seeing some significant problems with this image. Maybe it's just me, but here's what I think when I look at it. First, conceptually, it just doesn't work. 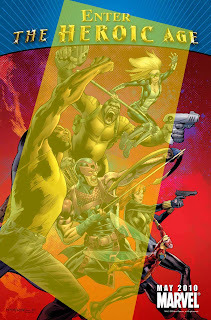 If Marvel's trying to tout this return to a heroic age, "a throwback to the early days of the Marvel Universe" according to EIC Joe Quesada, this image does not do that. 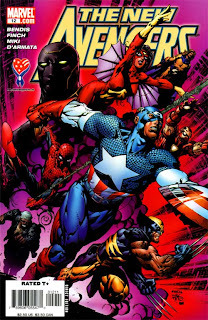 Thematically, it bears no real distinction against Marvel's work over the past several years that have been plagued with inter-hero conflicts. Does the above image feel any different than these...? It certainly doesn't to me! All that teaser image tells me is "more of the same." Random heroes looking tough and menacing. And there are these uncomfortable triangle shapes on all sides. Visually, it's not weighted very well at all and, speaking as a graphic designer, it's a poor use of the space. That upper left corner is completely dead space, and most of the right side isn't working very well either. The text/banner area at the top is worsening matters. That's not perfect, I'll admit, but I spent all of five minutes on it without even having access to the original source files. Still much better, IMO. The green lines I've drawn in represent the angle her hand is point: parallel with the ground. 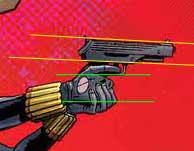 The yellow lines follow the gun itself, angling down about three degrees. Which makes it look like it's about ready to fall forward out of Widow's hands. If she fired that shot, she'd almost certainly miss her mark, and the gun's recoil would knock it out of her hands. Can someone tell me how that arrow is NOT falling to the ground? It's apparently being held in place entirely by his right hand at the very end of the shaft. Typically, the arrow shaft rests on the other side of the bow precisely because it allows an archer to use the fingers of his/her left hand to keep the arrow from falling or sliding out of place. It's certainly not unheard of for modern bows to have some sort of guides that allow the arrow to rest on the inside of it, but there's still something there that would keep the shaft in place. 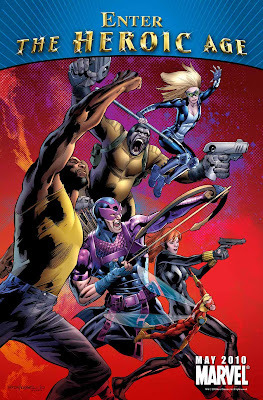 In this illustration, there's nothing and, by all rights, it should fall down to Hawkeye's feet. 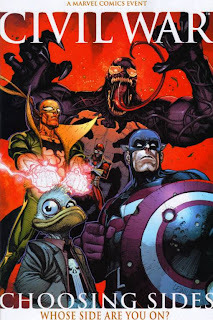 Really, I'm not hating on Marvel here. I'm just a bit confused. Hitch and Kesel are talented artists, and Marvel has some very capable graphic designers on staff. So what happened while they were working on this? 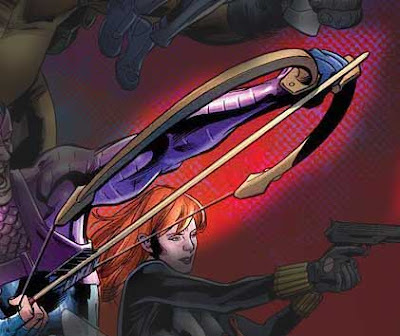 The bow and arrow thing seems to crop up quite regularly. I just read a book somewhere where I saw the exact same issue. Cool critique, by the way.